ATHENS — A father runs across the park, his seven-year-old daughter in tow and all his worldly possessions crammed into two overloaded backpacks, one on each shoulder. In his pocket, he has tickets to Milan for which he paid 35 euros each. Why Milan? Because it was the cheapest European destination the day he bought the tickets. His goal? To leave Greece, which he entered illegally one month prior, and to join his wife and another daughter, this one 14 years old, who made it to Belgium last week. The man, a well-known Turkish scientist who has a patented waste-management sorting system in which American policy-makers have shown interest, has tried five times already to leave Greece with his youngest of four children. And five times, he’s been refused. Today, he’s hoping he’ll be lucky. If not, he’ll try again in a week. If and when he gets to Milan, he will then make arrangements to meet his wife and start working on a plan to get to the U.S., where the family will start a new life, perhaps to be joined by their eldest two children, who are studying in the U.S. and Poland. He has a U.S. visa and his youngest daughter was born while they were living and working in Los Angeles, so she has U.S. citizenship. His wife and 14-year-old daughter do not. This scientist and assistant professor is one of many stateless souls making do in Athens, where they landed by inflatable raft after escaping persecution, incarceration and psychological, sometimes also physical, torture in their beloved homeland of Turkey. They all have different stories, but one important thing in common: They’re members of Hizmet, an Islamic social movement inspired by the religious teachings of Sunni Muslim preacher Fethullah Gülen, who advocates universal access to education, civil society and peace. Gülen — a living prophet to his followers — is also considered stateless, but has lived in Pennsylvania since 1999. The word Hizmet translates as “service,” which is what its proponents say they like about it. Critics have charged that the movement — which those interviewed insist revolves almost entirely around education — has “apocalyptic ambitions,” according to a New York Times article that quotes a disillusioned member of the group. Turkish President Recep Erdogan, who was recently elected to a fourth term and will be in power until at least 2023, has deemed the organization a terrorist group and has ordered more than 100,000 of its members fired from their jobs. Police must hunt them down in their homes while prosecutors must impose terrorism charges. Erdogan has also shut down several newspapers and nationalized most of the media in the country, something Turkey now has in common with many of its neighbours in the Middle East. And Bank Asya, which has been closely tied to the Gülen movement and at which followers had bank accounts, lost its banking permissions as part of the 2016 purges that Erdogan performed under what officials have deemed a “state of emergency” in response to 2016’s coup attempt. Many say they lost their life savings. When discovered as members of Hizmet, their passports and other forms of identification are usually confiscated or cancelled and they can’t apply for new ones, making leaving the country legally — on a plane, for example — impossible. Many of those who lost their jobs have subsequently been jailed, while others are on the run from the officials who would start the process of throwing them in jail. Those who’ve escaped with their families to Greece fear for their relatives back home, some of whom have nothing to do with the Hizmet movement but may be persecuted for their association alone or in lieu of their escaped family members. For that reason, most of those we interviewed asked that we not use their names or photograph their faces for this story. They are part of a mass exodus of intellectuals from Turkey. One of the more famous cases that’s only tangentially related to Hizmet is that of detained American pastor Andrew Brunson, whom Erdogan accuses of being a spy and part of the plan to overthrow the government in the 2016 coup attempt. Brunson is an evangelical Presbyterian pastor, but has been accused of supporting the Kurdistan Worker’s Party and the Gülen movement — both outlawed groups. The White House has pushed for his release and the issue has strained relations between the U.S. and Turkey, which are NATO allies. U.S. President Donald Trump has repeatedly made Twitter demands for Brunson’s release. In spite of a history of discord between Greece and Turkey — one that dates back centuries and certainly long before the current and long-simmering dispute over Cyprus — Turks, especially Gülen refugees, appear to be welcome here. 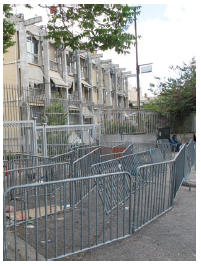 The Greek Asylum Service is familiar with their story and it is in a difficult position because the Gülen followers’ reason for fleeing becomes a political issue between states. Yet the Greeks do not turn them away from their adjacent shores on the Evros River (known as the Maritsa in Turkey). Indeed they take them in, dry them off and let them settle wherever their substantially depleted funds will allow. Many are desperately poor because they were unemployed in the months and years leading to their departure, and they’ve spent what was left of their life savings on the smugglers who helped them escape. Getting credit is a non-prospect given that they have little to no identification. Some get help from their families and others spend the last of their savings while hoping for a miracle, or a job in their adopted countries. The numbers of Turks seeking asylum in Greece have swelled considerably — even in the past six years. In 2013, 17 Turks sought asylum here, in 2017, 1,827 did so, and so far in 2018, they’ve received 1,839 applications for asylum, 687 of them in July alone for a six-year total of 3,955. In their rented home in central Athens, Bekir Bey and his wife, Beytül, are preparing breakfast while their children — boys aged 8 and 9 and a wide-eyed, expressive infant who’s 18 months old — sleep in. It’s an idyllic family scene, particularly after the harrowing journey they endured to get here. “I am happy,” Bekir says, his eyes warm and his smile broad. “I don’t have any money, but I am free, I am healthy and my family is safe.” He has no idea where they’ll end up, or what kinds of jobs await them. Many of those who’ve ended up in Canada, some of whom have PhDs, are driving for Uber. Bekir was a chemistry teacher at a college prep school and Beytül a homemaker who volunteered for Hizmet organizations. He was fired from his job in 2015 when the prep school was shut down for various reasons offered by Erdogan, including that they were only serving elites who could afford them. This was long before the attempted coup, which took place in July 2016 and resulted in 9,000 members of the Turkish armed forces, including a third of the military’s top commanders, being jailed. It’s thought that a faction of the armed forces, known as the Peace at Home Council, orchestrated the coup after Erdogan’s regime had been chipping away at the country’s secularism, as well as disregarding human rights. Erdogan himself, however, has said it was orchestrated by Gülen and his followers. The members of the Gülen movement charge that Erdogan himself orchestrated it as an excuse to disempower their people — all well educated and therefore threatening to a would-be authoritarian — for good. The irony is that the Gülen movement — whose followers generally advocate a conservative ideology — was an ally of Erdogan in his early days of power, but the relationship soured in 2013 when Gülen followers criticized the government’s response to a sit-in in Tazim Square and protested its policy of closing private Gülen prep schools. Today, they are sworn enemies. 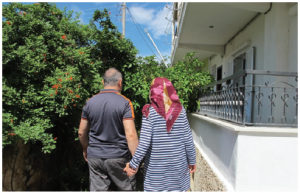 After Bekir’s dismissal, he and his family left their home because the government knew their address. They lived life on the run, fearing that if police found him, they’d throw him or his wife in jail, potentially leaving their children without parents. It wasn’t an irrational fear — they’d seen it happen many times before. Bekir sold cheeses and olive oils to earn a living and they stayed with family and moved often. After the coup attempt in July 2016, there was a warrant for his arrest because of his association with Gülen. Then came news that Beytül was pregnant with their third child — the bright-eyed girl who now delights her family in Greece. But going to a hospital or seeing a doctor would put them on Erdogan’s wide-ranging radar, and directly in danger’s way. She endured the pregnancy for eight months without any doctor’s appointments, but 10 days before she calculated she was due, she had to see a doctor because she was bleeding. It turned out that she would need a C-section, something that clearly had to be done in hospital. For their unborn daughter’s safety, she had to check herself in. Sadly, it was too risky for her husband to join her for the birth so she went with his sister and her own mother. Before she went, she wrote a letter to her two sons, in case she was jailed after the birth. “My kids were getting peer pressure because of our association with Gülen, so, in the letter, I told them that they had done nothing wrong. I told them not to be enemies with people, but rather to be enemies with the bad behaviour of others,” Beytül explains. Asked to see the letter, she says she can’t share it because they didn’t have a chance to pack such precious belongings when they left Turkey. After her C-Section, the mother faced a few medical complications. Worse than that, when she emerged from the fog of childbirth, she was greeted by four police officers. They were asking for her husband. She lied, telling them the two were separated, but they didn’t accept that explanation and within hours of giving birth, she and her baby were taken to a police station for questioning, and later, on her insistence, taken to a prosecutor’s office. To get there, her captors forced her to climb up into a van, though she told them she couldn’t because of her stitches. They insisted and the strain caused her stitches to rip. Her doctor had signed a form saying she needed to stay in hospital for up to a week and couldn’t go with the authorities, but eventually, the police convinced the doctor to reverse the order. The police interrogation room was already cold when Beytül entered and officers added to the frigidity by turning on the air conditioning full blast. She and the baby shivered for five hours as she tried to answer their questions without giving anything away. Add to that discomfort the fact that her milk hadn’t come in so she couldn’t feed her newborn. After almost two full days of questioning, they released her. That’s when the family finally decided to make the dangerous journey from Turkey to Greece. They took a chance most families don’t — they decided they would go it alone, without the help of an expensive smuggler. Bekir’s brother had fled a few months earlier and had shared his route with them. They would take their own inflatable dinghy and a pump, blow it up on the Evros River’s edge and hope that the brother’s path worked for them, too. Paying a smuggler anywhere from $3,000 to $4,500 per person wasn’t in the cards for them. They simply didn’t have that kind of money because Bekir hadn’t worked for a couple of years. As all those who’d gone before them had done, they left at night, carrying only what they could on their backs. In this case, that was one backpack with a few small toys for the children, because they knew they’d be detained for a couple of days upon reaching Greece. The dinghy — and the baby — added to their load. The journey always starts with a long walk. Most families describe it in terms of hours — and it’s always somewhere between three and five hours. Most estimate 20 kilometres in total. How do they get their small children to buy into the life-altering trek? This couple had been on the run and their boys were old enough to know what was going on so they were straight with them, but many — the families with two- and four-year-olds, for example — tell their children they are going on a big adventure that will involve walking through the woods at night, then taking a boat ride across a river. Many died on that journey. A Greek journalist told the story of a Turkish man who fled in a dinghy with nine on board, eight of whom, including the man’s entire family, died in the frigid waters of the Evros during their attempted winter escape. The man is now in Germany and trying to stitch together a new life for himself. A journalist’s younger children still think they’re on that adventure. The former editor looks older than his 40 years. His wife has a constant worried look on her face. She smiles occasionally, usually when one of her three children does something cute. The family — a boy aged 4, another aged 10 and a girl, aged 12 — have a one-bedroom flat in a suburb of Athens. Four of them sleep in a double bed, the fifth, on the floor next to them. But it’s better than the alternative in Turkey. He worked for Zaman, the then-largest independent newspaper in the country and one that was deemed sympathetic to Gülen. At its peak, it had one million subscribers, but is now closed by decree. This gentleman was a foreign correspondent on the Syrian border during the ongoing conflict. He was also working on his PhD. His wife taught at a Hizmet school — the movement had private schools across the country. Again, like many journalists, he ended up in jail after losing his job during a government raid — there are YouTube videos of the raid — on the newspaper. He was jailed for 19 months without charges, during which he endured harsh conditions with 46 men to a 13-person cell. They sat around the cell’s perimeter in the daytime and spread out like sardines across the floor to attempt to sleep at night. His saving grace came a few months before the June 2018 election when many of those detained without charge were released as Erdogan courted a few extra votes. The father was released in March, but with a trial pending, he knew he’d be back in prison again soon, so they left in a hurry before he had to report for his hearing. They paid a smuggler $7,500 to take them across the Evros River, a journey on which they all got soaking wet when they had to walk several kilometres before reaching the river. Today, the wife fears for her family back home as her father — a butcher by trade — is in jail for his association with Hizmet, leaving her mother at home alone. Her husband is not sure yet what he’ll do for work or where they’ll end up — he may try to finish his PhD, the research for which is on a USB among his few belongings. It’s morning in Athens and a five-year-old boy has just awakened. He’s a stranger in his new land and his pyjama top says it all: “Happy adventurer” with a plane on top and a scarf-clad teddy bear below. During his family’s escape across the Evros, the boy, who loves the TV series Adventure Island, told his parents he didn’t like their idea of an adventure at all. They took very little from their home — a few little toys, mostly Lego, for their son, some electronics and some clothing — basically what they could carry on their backs. When they left their home, they just locked the door and took off, leaving almost all of their belongings. The walk was a long one, about 15 kilometres — quite a trek for a five-year-old, especially when his parents couldn’t carry him. They paid smugglers $8,400 to take them across the river in a dinghy. After another such raid, the daughter printed a photo of Erdogan and pasted it to her dresser. “They won’t suspect us if they see this,” she told her mother. This couple also escaped by rubber dinghy and hopes to find a new life somewhere in Europe — even one hour of freedom in Athens would have been worth their escape, they say. They have two years’ worth of time in Athens if they succeed in receiving asylum, but spending two years not working isn’t feasible for them. He would, of course, like to teach again — he has a master’s degree in his specialty — but he’ll take what he can get. What’s important is that his family is safe and the psychological torture is over. In another part of Athens, a handful of women gather. 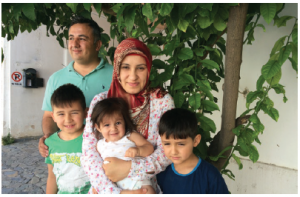 Their circumstances are now different, but they’ve wound up here for the same reason — they’re escaping Erdogan’s regime — and they are all separated by distance from their husbands. A dark-skinned woman in a magenta head covering is overcome with emotion as she tells her story. She has five children, two of whom remain in Turkey. She breaks down as she explains that the eldest, a 19-year-old who was studying at university, was arrested and remains in jail “because they were looking for us, his parents, but when they couldn’t find us, they took him instead. My son is a hostage.” Their 18-year-old, who is also a university student, remains in Turkey and she fears for his safety, too. Her husband and 16-year-old son have made it to Holland, and she and her two daughters, aged 9 and 14, await word in Greece that they can join them there. Meanwhile, she fears a recent suggested diagnosis of breast cancer. There’s evidence of it, but she has avoided getting a final diagnosis because she doesn’t want to start treatment in a country she could be leaving at any time. The stress of having a jailed son and what could be untreated cancer clearly weighs heavily on her mind. 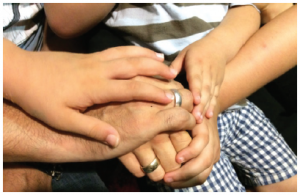 Three of the other members of this informal support network have husbands who’ve made it to Canada, all using U.S. visas and then crossing the border to Canada and applying for asylum. Former teacher Meral Budak has a fearlessness about her. She is married to a former journalist who is now driving for Uber in Kitchener, Ont. Her husband already has one of their two sons, a future Waterloo University student, living with him in Canada. She and her other son, 15, await word that they, too, are welcome. The only woman we meet on this journey who doesn’t cover her head, she also stands out because she allows us to use her name and her photograph. Her friend, who sports a headcovering with a leopard-skin print, is also awaiting word from her husband, who’s just started driving for Uber in his adopted city of Ottawa. He’s already reached out to Hizmet followers in the capital and is building a new life for them. Their children — a three-year-old boy and a two-year-old girl — are with her in Greece and, when offered some sparkly Canada stickers, they cover themselves in them. 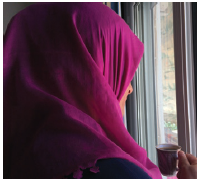 She, meanwhile, is finding being alone with two toddlers stressful — her boy still can’t speak as he’s been living in a country where no one speaks Turkish, and lacks the routine children crave — though she says the women help each other out. Still, to help her keep her spirits up, she admits to having consulted a psychiatrist. Yet another former teacher holds her two-year-old as she speaks about how she’s awaiting word from Vancouver that they can join her husband. All three escaped Turkey the same way, and all three did it alone with their children — their husbands having left before them. The woman whose husband is in Ottawa smiled when she reported that the smugglers she used gave her a half-price discount for each child. 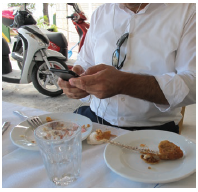 Constantly on his phone, a father of two is in Athens alone and has become a “connector” among the 800 or so Turkish families who live in the Greek capital. He facilitates interviews with Canadian journalists and informally helps new families settle when they arrive in Athens. He knows their stories, but he also has one of his own. Once the director of adult learning at the ministry of education, he was dismissed from his job in 2016. At a meeting with the Greek Asylum Service, he asks the director how he can help hasten the registration process for new arrivals. The highly educated former teacher — he, too has a PhD — offers to learn Greek and become a translator for the service, even on a volunteer basis. In his rational mind, he, of course, knows the service can’t use volunteers for those jobs, but he’s desperate to help his countrymen in whatever way he can. After all, he’s unemployed in Athens and his brain craves a challenge while he waits for his wife and daughters, aged 7 and 14, to raise the funds to hire their own smuggler and make the trek and crossing to Athens. He was hoping that would happen this past summer, but his wife tried and was denied permission to leave Turkey by plane, while his daughters were allowed to leave. Given that, the girls boarded their flight alone and visited their father for a few days before returning to Turkey to await another reunion down the road. Besides his own family, there are countless more to worry about back in Turkey. At last count, in July 2018, there were 170,372 dismissed from their jobs, many for their association with Hizmet and for their alleged involvement in the coup attempt. In addition, there have been 142,874 detained, 81,417 arrested. A total of 189 media outlets have been shut down and 319 journalists arrested. Dismissed academics number 6,021, while 4,463 judges and prosecutors have been fired. Turkish authorities dispute these numbers, which come from a journalists’ group called Turkey Purge. Back in Ottawa, Turkish Ambassador Selcuk Ünal defends his government’s actions. The media outlets were shut down because they were spreading terrorist propaganda, he says, and adds that the courts act independently and decide who and what to investigate. “There were a number of institutions shut down, yes, but after investigations, many of them were re-opened,” Ünal says. In addition, he maintains that many, after investigations, have returned to their jobs. Asked about the dismissal of teachers, he says the “Fethullahist” movement — which he refers to as a cult — uses education as its main method of indoctrination. Asked why the Gülen followers are considered terrorists, he says it’s because they were caught infiltrating the government a month before the coup and he accuses them of cheating on tests to gain entrance into the military. In addition, he says, government-employed members had their own special, highly encripted communications network. He says “the cult” bills itself as peace-loving but the government began wondering about a hidden agenda five or six years ago. Asked why their passports are taken, he says it’s so they can’t flee possible prosecution. For him, it’s all a matter of the penal code of Turkey, which says all members of a terrorist organization can be arrested. “But governmental authorities are only searching or investigating the ones who were [involved] in the coup attempt,” or those involved in the illegal activities of the group from “different walks of life.” The latter could include journalists and teachers, some of whom were using the prep schools for money laundering, he alleges. Asked how it feels to have Turkey’s World Press Freedom Index ranking drop to 157th of 180 countries, he said it was unfair because the journalists are being jailed for propagating the views of a terrorist organization. It’s later in the day now and the connector checks his WhatsApp to see if the scientist and his daughter made it to Milan. As he scans his new messages, a smile broadens across his dimpled face. Asked if there’s good news, he simply calls up a photo. It’s the professor and his adorable charge sitting together on a plane, sporting their own smiles. They made it through the first hurdle and they’re already writing a new chapter of their lives, one they hope will eventually take them to the U.S., where he hopes he can resume his career. For the connector, it’s a good day in Athens. Jennifer Campbell is Diplomat’s editor. Her visit to Athens was sponsored by a Gülen organization based in Canada. Organizers asked us not to name the organization because they fear for their own families who remain in Turkey.